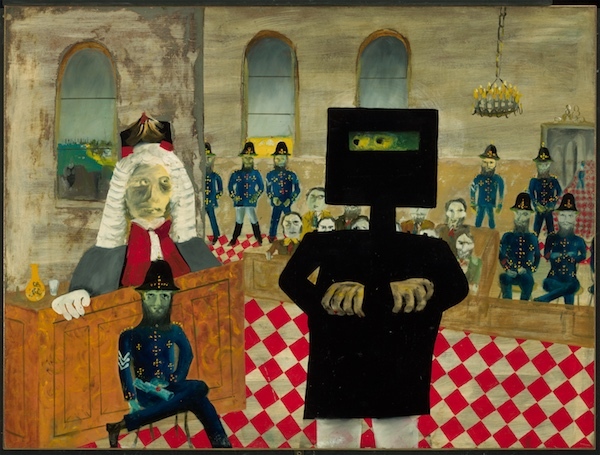 Sidney Nolan, ‘The trial 1947’, from the Ned Kelly series 1946 – 1947. Enamel paint on composition board, 90.70 x 121.20cm. Gift of Sunday Reed 1977. Courtesy: the artist and Murray Art Museum Albury. Sidney Nolan’s ‘Ned Kelly Series’ depicts the story of Australia’s most infamous outlaw in a sequence of 26 enamel on board paintings. Nolan’s starkly simplified silhouette and vibrant colour strokes brought this early colonial mythology to life, with Nolan’s depiction quickly forming part of Australia’s shared iconography. The series is a masterclass on Australian history and the development of a new figuration and landscape depiction in Australian art. ‘Ned Kelly Series’ is on tour from the National Gallery of Australia.